The bride-to-be couldn't be proud of her future groom who has committed his life to serving his country. Now, you're getting ready to tie the knot and be together forever, and you wan tot make the day truly special. One of our Bride Sitting on Mustang Saluting to Groom Wedding Cake Toppers will help you to honor his service, show her pride and add a little humor to your wedding cake! 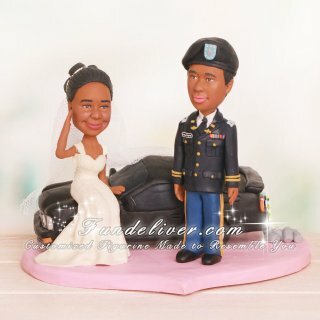 Our Saluting Bride Wedding Cake Toppers are Funny Military Wedding Cake Toppers that depict a bride saluting her groom. 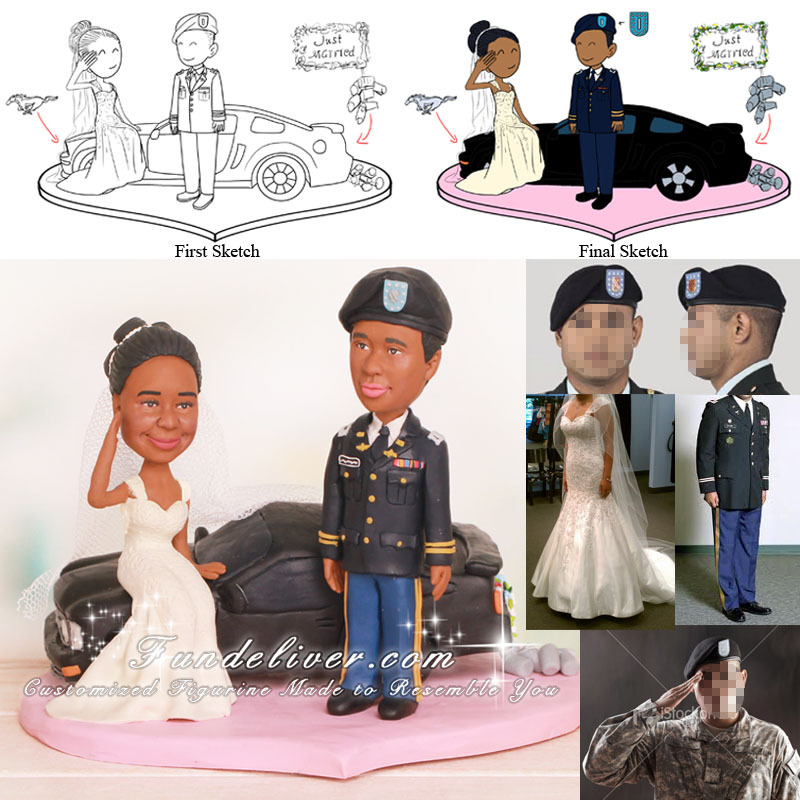 In this particular Funny Military Wedding Cake Toppers design, the bride is posed on the hood of a black Mustang sports car designed to look identical to the groom's. A chain of cans hangs from the back bumper beneath a sign that reads "Just Married." Her gown is covered with beading and has lacy shoulder straps with a sweetheart bodice. The groom is standing on the pink heart base wearing a replica of his U.S. Army dress uniform complete with pins, patches and insignias. Our Bride Sitting on Mustang Saluting to Groom Wedding Cake Toppers are made to order, so you are free to replace any of the details shown in this figurine set with items of your own choosing. We can use a different car or eliminate the military uniform and replace it with a tuxedo. A different branch of the service could be honored in the design or the shape and color of the base could be altered.